mwe3: Can you say something about each member of deVah and what does each one bring to the group sound? 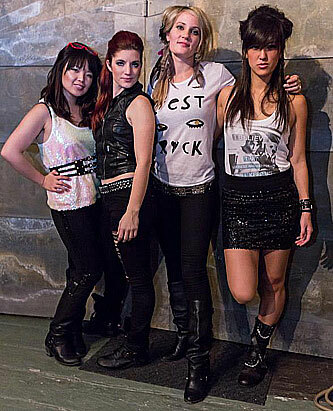 DEVAH: Liza writes all the music and is the bass foundation to the group. Emily, maintains her cool, and does all the lead, shred solos. Sharon, who also does a fair share of solos, is a fireball of energy, kicking everyone into hyderdrive  especially in our live shows. Moira is our rhythm guitar, mid-range time keeper and soul sister. 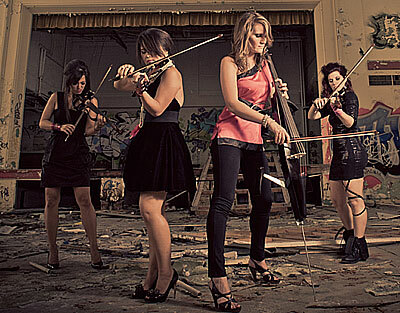 mwe3: Being that youre all string players how did deVah come together as a band? Was a shared interest and background in classical music and a love of rock at the core of the deVah concept? 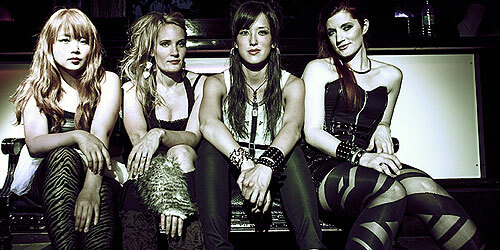 DEVAH: We got together originally to be a straightforward classical string quartet. We all have university degrees in classical music. Our group goal shifted over time, though, and our interest turned towards playing music that was more mainstream. We applied to Yamaha to see if there was any interest from them in sponsoring a string quartet group that went electric. As it turned out, there was! We then started playing covers  literally becoming a cover band, covering bands like Muse, Tool, Björk, Radiohead, Florence + The Machine, to name a few...and added a drummer. Then, as our sound started to develop, we began working on our own originals. mwe3: What was your first exposure to both classical music and rock / progressive rock and who were a few of your biggest influences on both your love of music and your own style of musicianship? How about music education and what were early musical studies like? DEVAH: (Liza) - I grew up in a musicians household  my father is a classical bass player and my parents met because my mom was the singer in my dads band when they were in high school. Consequently, I got a fair share of Beethoven and Bach, but also music by bands such as Genesis, Yes, Robert Palmer, Led Zeppelin, The Beatles, Laura Nyro and The Beach Boys. My parents were eclectic, and so naturally I became so. I think it is safe to say that all of these artists have sculpted how I hear and write music. mwe3: Your first deVah release is self-titled. How were the songs written, who wrote the music and what role did Robert Berry play in the production of the first deVah CD? Where and when was the album written and recorded? DEVAH: The songs are all written note for note by Liza; first by ear into manuscript using a program called Finale, and then brought to the next rehearsal. From there, each member puts their own stamp on the sound effects and styles used  so all songs are arranged by déVah. 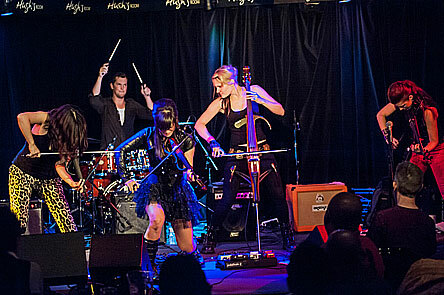 The songs were all written mainly on the road as Liza toured with another ensemble between 2012-2013. The album was recorded in November of 2012 at Soundtek Studios in San Jose, California. Robert Berry played a huge role in the production of our first album. His high musicianship, expertise and experience helped bring our vision to a whole other level. mwe3: Who else was involved in the album during the various stages and who was involved in the mixing, mastering as well as album design, including that great artwork on the first deVah CD? Our mentor, Joseph Schenck, played a huge role as well. He was a founding member of the late 1990s prog-rock band Pangaea, and was the one who introduced us to Robert Berry. mwe3: Can you say something about your work with Yamaha as well as some information about your gear including favorite amps, mics, and other effects? DEVAH: Yamaha sends us out on outreach programs and educator clinics to promote and spread the word about electric string instruments and their capabilities. We have a multitude of effects pedals  Lizas pedalboard includes a ZVEX Mastotron Fuzz, a Big Muff, a Boss Octave, a Small Stone phaser, and an MXR Delay. Emilys pedalboard includes an MXR 78, TC Flashblack, a Crybaby, a Boss Overdrive and a Holy Grail. She used a HiWatt SA112 in the recording. Sharons pedalboard is Boss-filled: harmonizer, digital wah, overdrive, distortion, delay and reverb. Moiras pedalboard includes an Electro-Harmonix Micro POG, an MXR and Boss Overdrive, a Crybaby and a Boss Delay. The amps that were used in the recording are different from our live show amps. Ampeg, Marshall, Hiwatt and Fender were used in the recording. Behringer, Orange, Blackstar and Fender are used in the live shows. mwe3: deVah has backed up other musicians. What have been some of your most memorable gigs with other musicians and what do you impart to these artists? And did deVah work with Brian Wilson and Peter Gabriel? Are there other artists youre planning to work with or would like to work with? How about some of your favorite current artists? DEVAH: Weve gotten lucky when it comes to the people we have worked with. We did part of Brian Wilsons tour while he was in Ontario. That was a person we never thought we would ever meet and it was so inspiring. And being on stage with Peter Gabriel for his Scratch My Back tour was incredible. He is such a showman, but backstage, he is actually a really humble, nice guy. He rode in the elevator with us and was like Nice day today, eh? The best part of any of these gigs would be the amazing food spread backstage and the huge audiences. There is such a huge rush performing in front of thousands of people, and déVah hopes to be the headliner at these big venues one day. If we could work with any top tier band or artist today, it would be either Björk or Muse. They are major inspirations for us and we have so much respect for them artistically and musically. mwe3: I know youve been written about in Prog magazine. So how do you feel about pioneering a new form of instrumental classical prog-rock with strings front and center? And what are you plans for the remainder of 2013 and into 2014? 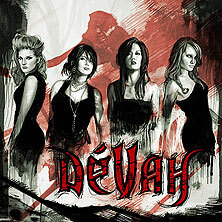 When can we expect another deVah CD to be underway and what kind of musical directions are you interested in or planning to go in the future? DEVAH: Prog magazine provided us with our first recognized stepping stone into the prog-rock genre and into the world-front. It was a tremendous compliment that they even took notice of us, and put one of our tracks on one of their compilation CDs. This recognition has fueled our fires, and we would like to get our music out to as many people as we can. Wed like people to know what strings are capable of in this day and age! We are currently working towards recording a live off-the-floor full-length album. We are also planning on making a few cool music videos. So please stay tuned  we will be releasing some more musical goodies as soon as we can!